Run any program in kernel space for maximum speed, but use your new power responsibly. From the scheduler to the device drivers, there's a lot to like and learn about the upcoming Linux 2.6. 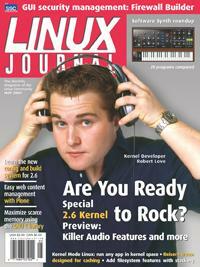 Configuring and building the kernel is simpler and more flexible than 2.4 and before. Here's how to customize your kernel or integrate your new feature. Discover the next step in the evolution of an innovative filesystem for Linux. Whether you want to emulate a vintage synthesizer or create a totally new sound, there's software to help make it happen. Discover a powerful, fast technique for text searching and filtering. Keeping memory requirements low can save you time and money. Here's how to bend malloc() to your will. Copyright © 1994 - 2017 Linux Journal . All rights reserved.